This seems like a book that markets Sharpie markers but it goes a bit deeper than that. Timothy Goodman is an illustrator, design and AD from New York and he loves using those Sharpie markers. This book is about what you can draw on with Sharpies and features the artworks of other artists who use these markers. 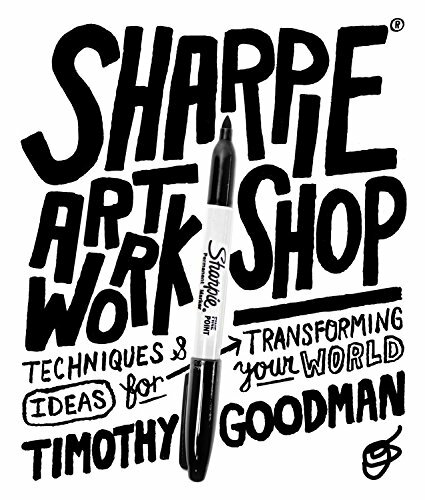 After a few pages showing you what are the types of Sharpie markers available in the market, it goes into the history, and then the different types of creative work created with them. There are artists who use the markers to draw, doodle, write, decorate gifts, create murals, draw on skateboards, on plates and other objects that can be drawn on. There are themes that you can explore, such as creating patterns, or drawing on objects that are discarded or neglected around the house. Then it features artists who have created works with that particular theme. The book's written in a conversational tone with big fonts that are accompanied by fun art. It's an interesting book to check out. I would say this is more like a sketchbook type of book because of the type of art featured.